Lipton English Breakfast Tea is a full-bodied English Breakfast tea - savoured by generations before us. It is the perfect accompaniment to the traditional English breakfast. It's a refreshing drink that is ideal both in the morning and throughout the day. 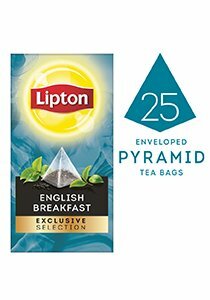 Presented in Lipton's pyramid tea bags, which were designed for a better infusion of the tea leafs. Since 1893, Lipton has been carefully selecting the best teas from around the world. This expertise gained over a hundred years has led to a wide range of high quality teas, providing the most demanding tea drinkers with pleasurable moments. Today, Lipton is the no.1 tea brand enjoyed around the world. Pyramid tea bag for more space so that expanding tea leaves can better infuse.